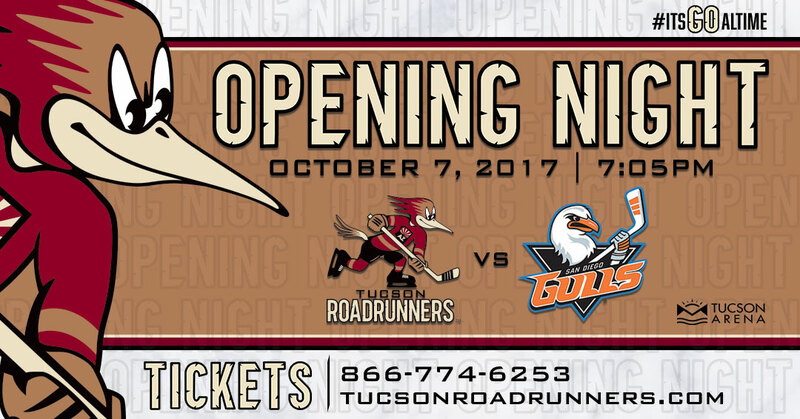 TUCSON, AZ – The Tucson Roadrunners, proud American Hockey League affiliate of the Arizona Coyotes, announced today that the team’s 2017-18 schedule will open at Tucson Arena on Saturday, October 7 against heated rival the San Diego Gulls at 7:05 p.m. This will be the first time the Roadrunners open the AHL season on home ice, after beginning the team’s inaugural season in San Diego last October. Tucson will face the Gulls, one of their top rivals from last season, a total of 12 times – the most of any opponent. The full Roadrunners 2017-18 schedule will be released tomorrow. Single game seats will go on sale in August. Full and 20-game Season Ticket Memberships are on sale now and include perks like exclusive member events, guaranteed lowest ticket price, the Never Waste a Seat exchange program, guaranteed access to Calder Cup and NHL Preseason tickets and more. Call 1-866-77-HOCKEY (774-6253) to pick your seats today, or visit TucsonRoadrunners.com for more information.